Planning a weekend getaway? Wondering where to stay in Edinburgh? Many visitors have heard about Edinburgh’s New Town and Old Town, but few know about the other fascinating neighbourhoods. Our guide walks you through some of the best places to stay in Edinburgh to help you make the most of your trip. From the trendy hipster vibe of Leith to the upscale restaurants of Stockbridge and the rich history of Dean Village, Edinburgh has some amazing neighbourhoods. In our opinion, these are the top five best places to stay in Edinburgh. Step back in time in Dean Village. Here, you’ll find narrow cobblestone streets and ancient architecture on the banks of a gurgling brook. Like something from a fairytale, Dean Village entices visitors with its timeless charm and fascinating past as a grain milling village. Not only is Dean Village a history-buffs dream destination, but it’s conveniently within easy walking distance of Edinburgh’s city centre. The neighbourhood is also home to the Scottish Gallery of Modern Art. 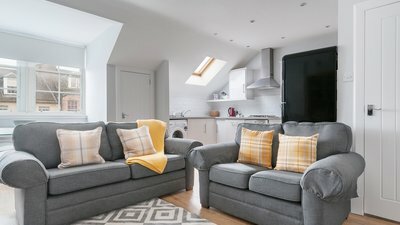 Our Dean Bridge Retreat self-catering apartment is an 11-minute walk from Dean Village. Get your groove on in Edinburgh’s hipster neighbourhood. Leith has some of the best independent coffee shops and pubs in Edinburgh. Thanks in large part to its rich cultural diversity, there’s also an excellent variety of restaurants, so you don’t just need to eat haggis and tatties. Dine on sushi one night and Indian the next, at Michelin-starred restaurants like The Kitchin or kebab stands, your dining options in Leith are truly limitless. The Waters of Leith have long had an important role in Edinburgh’s history and the original Leith harbour dates back to the 14th century. Make sure to check out HMY Britannia, one of Edinburgh’s top attractions. With such a rich past, Leith is a fascinating mixture of classic and contemporary buildings. We have several apartments in Leith like Britannia Quay or Trinity Mansion. Easily one of the city’s more affluent neighbourhoods, Stockbridge is another fantastic choice for Edinburgh visitors. An architectural smorgasbord, here you’ll find buildings representing some of Edinburgh’s most iconic periods. Stockbridge is perhaps best-known, especially amongst locals, for its excellent shopping opportunities. Home to high-end thrift stores selling designer products, speciality shops like upmarket cheesemongers, weekend farmer markets, and chic boutiques shopaholics will love staying in this neighbourhood. We have a number of fantastic apartments in Stockbridge. Check out the Edinburgh Grandeur @ Stockbridge or 2 Bedroom Apartment - Stockbridge. This UNESCO World Heritage neighbourhood is one of travellers’ favourite Edinburgh neighbourhoods. Along with its sister neighbourhood, Edinburgh Old Town, the New Town offers the best access to Edinburgh attractions, popular restaurants and evening entertainment. Don’t let the name fool you. Edinburgh New Town actually dates back to the late 18th and early 19th-century! As such, the area has a gorgeous collection of Neoclassical and Georgian architecture, which is well worth exploring if you’re not already staying here. In addition to stunning buildings, Edinburgh New Town is also particularly well-known for shopping with streets like Princes Street and George Street offering upmarket department stores, branded shops, and designer boutiques. Nestled along side streets, you’ll also find independent gems selling everything from antiques to yoga pants. Some of Edinburgh’s best attractions are also in New Town. Top highlights include the National Gallery of Scotland, Assembly Rooms, and the iconic Scott Monument. If you’re arriving in Edinburgh by train, you’ll come into Waverley Station in New Town. Many of our holiday apartments are in Edinburgh New Town. We have apartments on Rose Street, Thistle Street, Frederick Street, North Charlotte Street and near St. James Square. Another fantastic and very popular city-centre neighbourhood, Edinburgh Old Town, as the name suggests, is the oldest part of Edinburgh. Almost all of the buildings here date back for centuries and the area is neatly divided by the Royal Mile with Edinburgh Castle at one end and Holyrood Palace at the other. Walking through this neighbourhood feels like stepping back in time to an era when Kings and Queens still ruled over commoners and Scots is still spoken on the street corners. In addition to the classic tourist attractions, like Edinburgh Castle, St. Giles Cathedral and Holyrood Palace, Edinburgh Old Town also has a number of newer, more interactive and kid-friendly attractions. 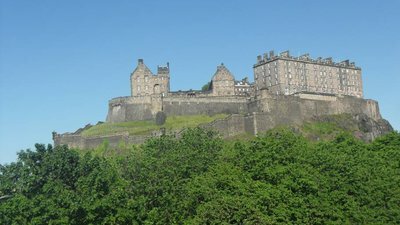 Make sure to check out Camera Obscura, the Real Mary King’s Close, and the Edinburgh Dungeons. Most walking tours start from Edinburgh Old Town. Finding affordable accommodation in Edinburgh Old Town can be difficult. But, we offer a range of self-catering apartments to suit nearly every budget and traveller. View our Chessel Court, High Street, Hunter Square, Tron Square, and West Bow apartments -- all located a one minute walk from the Royal Mile. 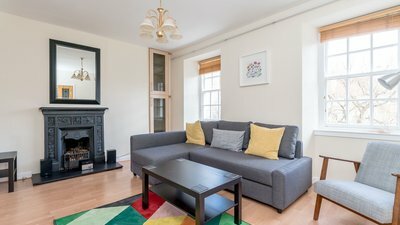 Where to Stay in Edinburgh, Old Town or New Town? Ah, the age-old debate. Both Edinburgh Old Town and New Town are fantastic neighbourhoods for exploring everything our beautiful city has to offer. When choosing between the Old and New Town, it really comes down to the type of experience you’re looking for. Staying in Edinburgh Old Town puts you at the heart of the action as the Royal Mile is literally on your doorstep. However, if you want somewhere slightly quieter, yet still within walking distance Edinburgh New Town is your best bet. However, you really can’t go wrong with either choice. West End. Edinburgh’s West End, just off Princes Street, is the city centre’s more residential area. As such, it’s quieter than the Old or New Town yet still within walking distance to shops, attractions and restaurants. Check out our Melville, The Studio, Dean Bridge, or Luxury West-End apartments. Tollcross. Known as Edinburgh’s theatre district, Tollcross is home to the King’s Theatre, the 1920s Cameo cinema, and a stone’s throw from Usher Hall and the Lyceum Theatre. While it’s not as high-end as the West End, Tollcross has a student vibe with excellent pizza shops, cafes and art stores. View our Lochrin Place and Leven Terrace apartments. Calton. Near Holyrood Palace, to the East of Edinburgh Castle, you’ll find Calton neighbourhood with Carlton Hill, one of the city’s most iconic views, and a fantastic LGBTQ scene. While Calton can’t hold a candle to San Francisco's Castro or Manhattan’s Greenwich Village, it does have a great LGBTQ nightlife. Planning a trip to Edinburgh during August is a completely different beast. With streets thronged with festival goers and venues scattered throughout the city, it can be difficult to know where to stay. Here are our recommendations for Edinburgh Fringe accommodation. Marchmont. Many of the Edinburgh Fringe venues are within or around Edinburgh University and the Meadows. As such, Marchmont is one of the most convenient neighbourhoods for Edinburgh Fringe accommodation. In addition to direct access to Edinburgh Fringe venues, you’ll also find a friendly student vibe and plenty of on-street parking. We have a number of Marchmont apartments like Roseneath, Gladstone, or Burgh Loch Boutique. Southside. On the other side of the Meadows and slightly closer to Edinburgh University is Southside neighbourhood. Located halfway between the Royal Mile and university, staying in Southside puts you within walking distance to top Edinburgh tourist attractions (after all, you can’t visit Edinburgh and not see the castle) as well as Fringe venues. For Southside accommodation, check out our Davie Street, Parkside Terrace and The Old Chapel @ George Square. Haymarket & Dalry. If you’re looking to escape the mayhem of the Edinburgh Fringe while still accessing gigs and shows, the Haymarket and Dalry area is a good choice. Slightly outside the city centre, these areas are often quieter and are only an extra five or ten-minute walk away from top attractions and venues. Since Haymarket is Edinburgh’s second major train station, staying here is also super convenient. Our Dalry Gait and Murrayfield apartments are great Haymarket accommodation options. Looking for somewhere slightly outside the city centre? 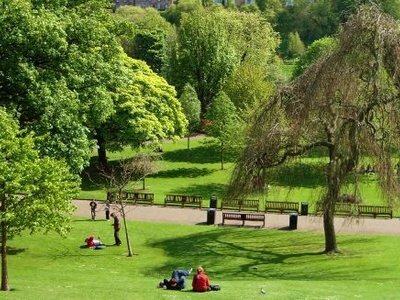 Whether you’re looking to escape the crowds or simply want to experience a different side of Edinburgh, there are some great family-friendly neighbourhoods near Edinburgh. Morningside. One of Edinburgh’s poshest neighbourhoods, Morningside is a top contender for places to stay near Edinburgh city centre. While there are a number of great local restaurants and shops, you can also easily jump on a bus and get to Edinburgh tourist attractions in a few minutes. Portobello. To the east of Edinburgh city centre, you’ll find the quaint neighbourhood of Portobello. Portobello is a fantastic place to stay during the summer as it has a promenade and large sandy beach. You can brave the chilly waters or simply admire the coastal views. Check out our Portobello Apartment. South Queensferry. Home to the iconic Forth Rail Bridge, South Queensferry feels a world apart from the hustle-and-bustle of Edinburgh. The neighbourhood boasts a historic high street with many cute cafes, independent boutiques and pubs. You can even have a pint in The Hawes Inn from Robert Louis Stevenson’s classic novel Treasure Island. When travelling with children, it’s important to choose the right accommodation. You want somewhere close enough to the city centre, so you don’t need to spend hours on public transport, yet far enough away to provide peace and quiet. Edinburgh has some excellent family-friendly neighbourhoods. Stockbridge. Locals and visitors alike love Stockbridge. It has some great play areas as well as a fantastic local library to help entertain wee ones. Young travellers will also enjoy exploring Stockbridge’s farmers market or watching the ducks on the Water of Leith. View our Edinburgh Grandeur @ Stockbridge or 2 Bedroom Apartment - Stockbridge apartments. Newington. While Newington is only a ten-minute walk from Edinburgh City Centre, it feels a world apart. This area is particularly great for families as it borders the expansive Holyrood Park and Arthur’s Seat, so your wee one has plenty of room to run and play. Our Parkside Terrace and Gatekeeper’s Cottage are fantastic Newington options. Gorgie. To the west of Edinburgh city centre, Gorgie is another great choice for those visiting with children. One of the neighbourhood’s best-loved, kid-friendly features is Gorgie City Farm. Here kids can learn about growing vegetables and meet some of the animals like Rambo the Shetland pony.